I have been putting this book on hold for awhile because I love two other series by this author and I was worried that I might not like this one. I was wrong. I should have never doubted the wonderful Larissa Ione. This book had love, romance, revenge, heartbreak humor, action and some steamy scenes. I love the story behind the vampire legend and how it is tied to Native American lore. I’m really looking forward to reading the next books to see how that developed. Nicole I liked; she was smart, humorous and willing to be open minded by things. Even though she had a huge fear of vampires ( after what they did to her family I can see why but her family was pretty flipping evil for making it easy and acceptable to enslave vampires and how the treated the servants) she also loved her nanny vampire that she witnessed dying and she gave the other vampires a chance ( even though she escaped/tried to escape a few times out of fear). Riker reminded my of other male characters from Demonica series and Lords of Deliverance series. Now while that might by annoying for some I actually liked those characters and I am glad to see that Riker resembled them but still had his own personality ( In my opinion). He was out for revenge but he softened towards Nicole and became more of a protector for her. I liked his humor ( the bit we see in between the grumpiness) and I liked watching him gradually accepting the feelings he has for Nicole. He pushes her away a lot but there is some complicated history between him, her and her family. The rest of the character made the story more interesting to me and excited to see more of them. Like I said I waited forever to pick this book up and read it because I was worried the author wouldn’t be able to make a third series that I liked as much as her other two. I was wrong. So wrong. I read it from beginning to end from 8pm to around 2am. It kept me turning the pages with all the action and wanting to see what happens next. 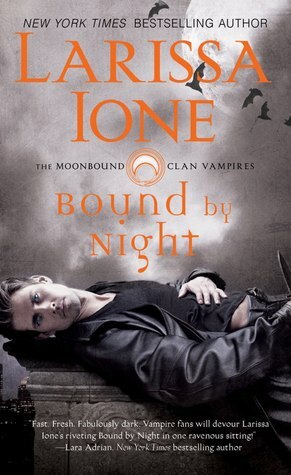 Great story, interesting vampire lore, great characters, action and humor. Wonderful start to another awesome series by this author.